3,000 German travel agents have received specific training on Tenerife in 2018. This is the first phase of the TUI INSIDE 18/19 campaign, the most important action the island is developing in the German market, and also the most outstanding of those that TUI Germany carries out throughout Europe, which once completed will have reached 7,500 travel agencies in Germany - 75 percent of all of the country. The initiative is co-financed by the Cabildo, through Turismo de Tenerife, and the Government of the Canary Islands. 15 companies of activities in the nature of the Island have already confirmed their commitment to sign a letter of quality aimed at improving the services they provide to tourists. Promoted by the Cabildo through Turismo de Tenerife, the document seeks to replicate the successful model of the Tourism Sustainability Charter in Cetacean Sightings. The initiative was presented this week to businessmen by the island's vice president and tourism councilor, Alberto Bernabé. Tourism has generated for Tenerife a total of 4,474 million euros in 2018, which is 169 million more than the previous year, which strengthens its hegemonic position as a key sector of the island's economy. The good evolution of tourism, which closed 2018 with a total of 5,801,954 tourists housed in tourist establishments (+1.7%) which again represent a historical record, has favored these results. The Cabildo, through the Tenerife Work & Play brand, has organized several routes which will show the possibilities of the Island for remote workers. The labeling of one of the convoys covering the route between Santa Cruz and La Laguna will last two more months. The festival will take place on September 7 and 8, at the Beach of Martiánez and will give away cash prizes. Tenerife’s Thai-themed water kingdom, Siam Park , has claimed the pole position as the world’s ‘Best Water Park’, for the fifth consecutive year. Siam Park has secured the TripAdvisor Traveller's Choice Award for the ‘Best Water Park in the World’, following positive reviews from its visitors across the globe. The park, which will be celebrating its 10-year anniversary in September, has also just welcomed the arrival of two new attractions; Patong Rapids and Coco Beach. As summer kicks off, Siam Park is getting ready to start its long-awaited 'Siam Nights' - evenings of real fun under the full moon during the months of July and August. It begins Friday, June 29th, and will then take place every Friday and Saturday from 8pm until midnight. A video of the Island titled ‘Lighting Tenerife’ by the national influencer Marina Comes competes for the AMEX Traveler Award from the American Express financial institution. The competition is five other Spanish destinations in a contest that recognizes the best Spanish digital influencer for its ability to illustrate the best travel experience. The action has the collaboration of Turismo de Tenerife. The 'Zen Garden' is a landscape aquarium that was inaugurated today, Thursday, May 31, and will be open to the public from tomorrow on the 'AquaViva' exhibition. The Tenerife Walking Festival (TWF) is already preparing its fifth edition, after the success of this year's edition, which concluded on Saturday in a great celebration in the European Square of Cross port. The event, which is expected to take place at the end of May 2019, has reaffirmed itself as one of the most outstanding hiking events in Europe. Turismo de Tenerife, the tourism board for the largest of the Spanish Canary Islands, Tenerife, has announced a familiarization trip to the island on November 2018. Visit www.Quest Travel Adventures.com for more information. 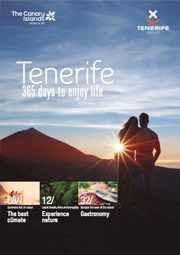 TraveltoTenerife.com, the official website for the Canary Island of Tenerife in North America (www.traveltotenerife.com) announced today the launch of their new travel agent academy portal. Sixty miles off the southwest coast of Morocco, the Canary Islands treat their 15 million annual visitors to freshly caught seafood, black-sand beaches, and, perhaps most importantly, a reliably sunny forecast. “That’s why half of northern Europe is there allwinter,” jokes ELLE Spain’s head graphics editor, Reyes González-Río. Traktek Partners, a full service travel marketing agency in Boston, announced today they have been re-enlisted as the official Office of Representation in North America for Turismo de Tenerife. In addition, Traktek will develop and manage a comprehensive marketing plan to increase U.S. travel trade awareness. The marina, Marina del Sur will host the second edition of this event that brought together more than 3,000 people last year. Wolfgang Kiessling, President and Founder of Loro Parque and Loro Parque Foundation, received the Global Humanitarian award from the first state animal protection organization in the United States this September. Specifically, for his efforts on the ethical protection of nature, for the common good and for diversity. These distinctions are given by American Humane. Traktek Partners, a digital marketing agency in Boston, announced today they have been re-awarded the contract as the official Office of Representation in North America for Turismo de Tenerife. Tenerife will once again host the Windsurfing World Championship of the Professional Windsurf Association (PWA). The beach of El Cabezo, in the coastal core of El Medano (Granadilla de Abona) will be where it takes place, which will take place from August 6 to August 12. 160 writers will take advantage of their stay and carry out multiple activities in Tenerife during The Travel Bloggers Meeting 2017. The Tenerife Walking Festival (TWF), one of Europe’s most important hiking events returns to Tenerife May 23rd – May 27th. The trail wraps among the most spectacular natural settings of the island, complimented by varied activities. In turn, raising environmental awareness to an already landmark event. On December 2nd opens to the public the VIII Tenerife Art Market Happy Navidad. Salvador Dalí will chair Tenerife Fine Arts Exhibition entitled "Happy Christmas"
The art market Christmas 2016 will feature with more than 100 artists´s work. 12 pieces of the great surrealist painter will go on sale through an agreement with a German collector. The Fine Arts, more surreal than ever this Christmas, invites us on a journey to the universe of more contemporary art. Boston agency will develop marketing plan to increase Tenerife tourism in 2017. Cyril Lemaire, Managing Partner at Traktek Partners, said his firm will develop and manage a comprehensive marketing plan to attract North-American travelers to the island of Tenerife. Traktek Partners, the Official U.S. and Canadian Office of Representation for Turismo Tenerife and Tenerife, Spain, in conjunction with Quest Travel Adventures, the preferred U.S. tour operator of Tenerife, is excited to announce that the Island of Tenerife has the highest year over year growth of any destination worldwide on the TripAdvisor website - an impressive 55% growth, predominantly from North American travelers, per 3rd party platform measurement company comScore, Inc. This morning has been presented at CaixaForum (Madrid) the programme of the third edition of Starmus Festival. Under the title “Beyond the Horizon-Tribute to Stephen Hawking”, the Festival will pay a very special homage to the professor and scientist. The island of Tenerife, an island off the coast of Spain, that was recently awarded the Trip Advisor 2015 Travel’s Choice Award, has re-enlisted Boston-based digital travel marketing agency Traktek Partners (www.traktekpartners.com) to develop and manage a comprehensive marketing plan to attract North-American travelers to the island. Tenerife has enlisted Washington, DC-based digital agency Unison (www.unison.net) and Boston-based marketing agency Traktek Partners (www.traktekpartners.com) to develop a comprehensive marketing plan to attract North-American travelers to the island. The multi-faceted campaign will include a creative and branding campaign called “Adventure On, Tenerife”, tour operator and travel agent outreach, and a consumer focused marketing and communications plan.